Marc became an amputee as a result of a motorcycle accident while in high school. Following college he rediscovered his athletic side and made the U.S. Disabled Ski Team. It was at this time that he began crossing new boundaries in the disabled ski world as a top free-skier, writer, producer and teacher on the unique top end and independence generating attributes of the sport for the disabled/adaptive community. His long time racing, extreme skiing and friendships with the world’s best disabled skiers, along with his writing and story-telling talents, led him to create and produce the highly acclaimed PBS doc/program, Heroes of the Slopes (HOTS). Marc’s presentations use incredible adaptive skiing stories and characters from the original HOTS. Some of the persistence, adaptive technology and elite adaptive skiing messages are indeed derived from his personal media making, improved prosthetics, extreme skiing on one leg and other personal challenges. But he is also a great writer, producer and story-teller about his elite adaptive skiing peers who have done so much for the evolution of the sport, and for others. 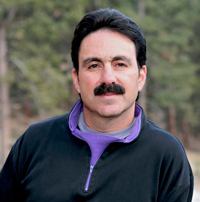 Mr. Romero also produces an internet program on adaptive skiing and continues to to produce stories and videos which he calls, The Adaptive Skiing Revolution. In 2010 Marc attended and presented his stories/messages at the Paralympics in Vancouver, and was also invited to the White House in July to celebrate the 20th anniversary of the ADA with other disability advocates, innovators, motivators and leaders.